Misc. brushes, cotton swabs, bowl swabs, artist brushes, acid brushes, sash brushes, foam brushes, camel hair brushes, acid swab, glue brushes, swab brush, mandrel brushes, wall smoothers, wallpaper brushes, kalsomine brushes, masonry brushes, concrete coaters, whitewash brushes, parts cleaning brushes, bleach brushes, white tampico brushes. 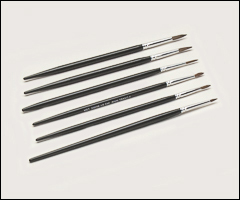 Miscellaneous brushes useful for touch-ups or working with resin in hard to reach places. 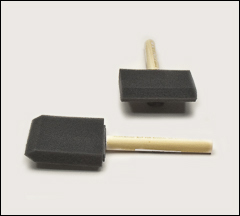 For disposable layup brushes, please see our Square trim brushes page. 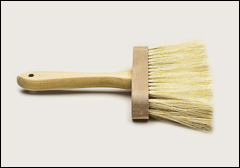 For finer finishing brushes, please see our Chisel trim brushes page. Camel hair round artist brush for touch-up work. Can be used with water or oil-based paints. Black gloss wood handle. 6 3/4" handle length. 7" approximate overall length. Sold by the pack, 12/pack. 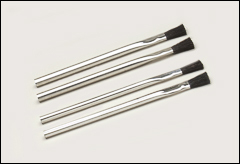 Disposable brushes for applying acid, glues, coatings, cements, fluxes, solder, paints, and stains. Tin handle, black horsehair fill. Sold by the box, 144/box. Durapro™ polyfoam resists water and solvents. Gray China bristle with chisel construction is a soft formulation with a velvet feel. Seamless nickel-plated steel ferrule. Used for chip removal, solvents, and mold release. Also used for parts cleaning, applying adhesives and lubricants. Can be used with oil or water-based paint or varnish. Sold by the box, 12/box. For interior and exterior enamels, stains, latex, and oil-based paints. Not for shellac or lacquer. Polyurethane foam, beveled end, wood handle. Wooster #3102. Sold by the box. Two rows of white tampico fill. For working mandrels or layup of large areas. Can be cut into convenient widths. 12/box but sold in any quantity. Tampico fill carries liquids better than synthetics. Resists chemicals, solvents, heat, and taking set. Fast, thorough coverage with resins and thick coatings. White tampico fill is great for thin coatings. 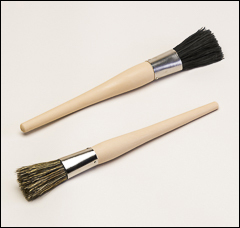 Wood block with two tapered handle holes allows using the brush at different angles for best application. 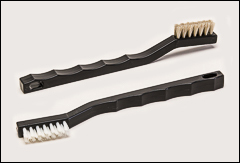 Nylon or horsehair filled toothbrush-style parts brushes. Both styles are 3 x 7 row fill, trimmed 1/2" long. Plastic handles are 7" long by 7/16" wide. 36/box but sold in any quantity. 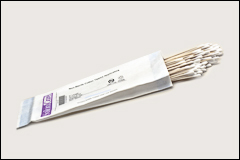 Wood stem cotton swab, 6" overall length. Effective, inexpensive method of applying resin into difficult areas such as small diameter drilled holes and reaching and dabbing other small voids. Sold by the box, 1,000/box. Acid resistant coarse synthetic yarn in a 4" diameter head. 12" plastic handle. Used to apply cleaners, releases, waxes, etc.